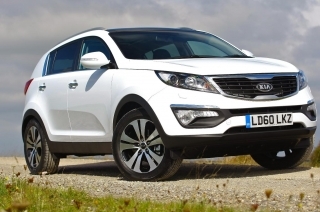 Kia's stunning new Sportage crossover goes on sale across the UK Kia dealer network today as a full 16-model range following the huge sales success of the early First Edition version that went on sale on 1 August. The line-up includes four engines, including brand-new highly efficient 1.6-litre direct-injection petrol and 1.7-litre turbodiesel units. These engines come as standard with a six-speed manual gearbox and front-wheel drive, while with the 2.0-litre engines buyers are offered the choice of five-speed manual or six-speed automatic on the petrol and six-speed manual or six-speed automatic transmissions on the diesel. All 1.6 and 1.7-litre versions of new Sportage feature Kia's Intelligent Stop and Go (ISG) technology and sit under Kia's ‘EcoDynamics' banner, while the new Dymax intelligent all-wheel-drive system is standard on every 2.0-litre model. The 16-model range is based on Kia's familiar 1, 2 and 3 trim designations, with all-wheel-drive versions given the KX preface. There is also a special range topping ‘Sat-Nav' grade of new Sportage 3 and KX-3, featuring a fully integrated 7-inch touch screen satellite navigation with built in reversing camera and upgraded audio sound system. All versions are extremely well specified, as buyers have come to expect from Kia, and are covered by Kia's pioneering seven-year warranty that can be transferred to subsequent owners as long as the 100,000-mile limit has not been reached. Yet even with such a high level of standard equipment and warranty, prices start from £16,645. The First Edition model, which allowed Kia to put new Sportage on sale earlier than had been originally anticipated, is discontinued with the arrival of the complete line-up. When Kia's design teams under Chief Design Officer Peter Schreyer began work on the new Sportage a little over three years ago, they identified that the then largely unheard-of crossover type vehicle - combining much of the stance and attitude of a compact SUV, but with sleeker looks and a greener conscience - would play an increasingly important role in buying patterns of the future. The car they have created is a five-door, five-seat crossover with the style to attract people who might otherwise have looked at a Nissan Qashqai, Peugeot 3008, Ford Kuga or Volkswagen Tiguan. It has been designed to meet the requirements of young families - or the young at heart - who lead busy, primarily urban-centric, lifestyles. Chief Design Officer Schreyer says the aim with new Sportage was to make it an object of desire rather than a mode of transport. 'The allure of a Kia should extend well beyond the fact that it moves people from one place to the other,' he says. Sleek and rakish, new Sportage is a radical departure from the 2004 model it replaces. It successfully incorporates the key features of an SUV in a more urban-friendly, more athletic and more muscular package, and features the tiger's nose grille surround that Schreyer is turning into a Kia trademark and an instant identifier. The high shoulder and low roof lines meet in striking reverse-angle C-pillars that improve the view out for rear passengers. The ribbed roof, chunky door handles, LED day-time running lights and large wing mirrors are as much signs of new Sportage's street-wise urban toughness as its capability in difficult conditions. The spacious five-seat cabin is as dynamic as the exterior and is dominated by a multi-tier dashboard that narrows as it sweeps in from the sides towards the middle, leading into an eye-catching centre console. The design deliberately emphasises the width of new Sportage and also gives occupants a feeling of protection and safety. The new Sportage is longer, lower and wider than the more traditional SUV it succeeds. It also weighs around 90kg less and has a sleeker aerodynamic profile, with a drag coefficient down from 0.40 to 0.37 Cd. All of this has ensured that it is not only more stylish and sporty, but also more environmentally friendly. Widened front and rear tracks enhance stability and driving enjoyment, while the reduced ground clearance aids fuel consumption and emissions at the same time as reflecting that the car's role is increasingly less likely to be as an off-roader. All-wheel-drive versions of new Sportage are still more than capable when called upon to perform in adverse conditions, thanks to their intelligent, drive system - Dymax - from Magna Powertrain. With the new 1.7-litre turbodiesel engine and the fuel-saving assistance of ISG, new Sportage is capable of average fuel economy of 54.3 mpg, while CO2 emissions are only 135g/km - on 16"/17" alloys. Yet it is still a sprightly performer thanks to its 114bhp and 255Nm (188lb ft) of torque. The new 1.6-litre direct-injection petrol engine, which develops 133bhp and 165Nm (122lb ft) of torque, gives new Sportage even livelier performance, yet not at the expense of fuel economy or emissions. With the help of ISG, average fuel consumption is 44.1mpg, while CO2 emissions are 149 g/km. The 2.0-litre turbodiesel develops 134bhp at 4,000rpm and 320Nm (236lb ft) of torque from just 1,800rpm, which means new Sportage has a better power-to-weight and torque-to-weight ratio than the previous model with the older 2.0-litre diesel engine. Yet it is more fuel-efficient and less damaging to the environment. With the six-speed manual gearbox new Sportage 2.0 CRDi achieves (on 16" or 17" alloys) combined economy of 49.6mpg - 9.8mpg better than the old car - with CO2 emissions of 149g/km, a huge reduction of 38g/km. But it also accelerates more quickly and has a higher top speed. Even with the six-speed automatic it betters the previous manual model, with fuel consumption from 40.9mpg (versus 39.8mpg) and CO2 emissions from 179g/km (formerly 187g/km). It is also quicker and faster than the previous manual Sportage. 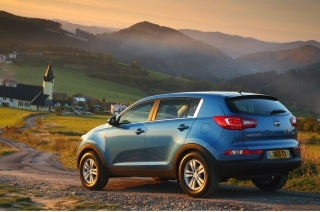 The 2.0-litre petrol engine is the most powerful of the four options in new Sportage. It develops 161bhp, with 194Nm (144lb ft) of torque, and has continuously variable valve timing to ensure good driveability in all circumstances. In manual form it allows new Sportage to achieve fuel consumption from 37.2mpg with CO2 emissions from 181g/km, while the automatic is only fractionally behind with 34.4mpg and 195g/km. The Dymax intelligent electronically controlled single high ratio all-wheel drive system from Magna Powertrain continuously monitors driving conditions and anticipates when all-wheel drive will be needed, whereas other systems only react to changing conditions. With Dymax, the new Sportage is always in the correct drive mode for the prevailing circumstances. Dymax normally delivers 100% of engine torque to the front wheels. But the torque can be redistributed up to a maximum of 60:40 front-to-rear to enhance cornering stability or if road conditions deteriorate. For off-road driving, owners can manually select lock mode, which gives a 50:50 torque split at speeds of up to 25mph. All versions of new Sportage feature a new electronic motor-driven power-assisted steering system that ensures light, easy manoeuvrability in the busy urban environments the car has been designed to slip into, with just the right weightiness and feedback to make the car agile and stable at the higher speeds common on motorways. A number of new electronic features have been added to new Sportage to increase both safety for on-road driving and the car's capability for those owners who wish to go off-road or who live in areas where bad weather and poor driving conditions are facts of life. New Sportage is a fully-specced car even in the entry-level 1 trim grade. Standard items include 16-inch alloy wheels, air conditioning, all-round electric windows, a reach & rake adjustable steering column, LED daytime running lights, body-coloured electric door mirrors, remote central locking, a leather-covered steering wheel and gearlever knob, front fog lights and cornering lights, automatic rain-sensing windscreen wipers, Bluetooth connectivity with voice recognition, cruise control, steering wheel-mounted controls and an iPod connection. New Sportage 2 and KX-2 add part-leather upholstery, roof rails and privacy glass, reversing sensors, panoramic sunroof, 17-inch alloy wheels, folding LED mirrors, a luggage net, vanity mirror illumination, adjustable drivers seat lumbar support and a trip computer. The flagship Sportage 3 and KX-3 versions additionally have full leather upholstery with heated front and rear seats, dual-zone climate control, Xenon headlights with washers, automatic headlights, front wiper de-icer, premium vision instrument cluster, auto-dimming rear view mirror and 18-inch alloy wheels. All versions of new Sportage 3 and KX-3 are also available as a special range-topping satellite navigation model which includes a rear-view safety camera that transmits an image to an LCD colour display integrated into the 7 inch in-dash screen. This model is also available with an upgraded audio system with external amp and sub woofer.